Asphalt Time. Weather Warms. Paving Finally Begins. After a week of snow and cold, the weather gods relented. The sun came out. The road crew reappeared. I wonder if they enjoyed a week of leisure with their feet up before getting the call again. Something tells me not likely. Anyway, once again the pickup trucks pulled in before dawn and the crew swarmed like ants over the great machines which were silent no longer. The deep RRRR of engines starting up pierced the morning solitude. The rollers and the huge white RoadTec monster rumbled to life, their warning lights starting to flash, their keepers inspecting them all over in case they come to some harm during their dormancy. So the process began. 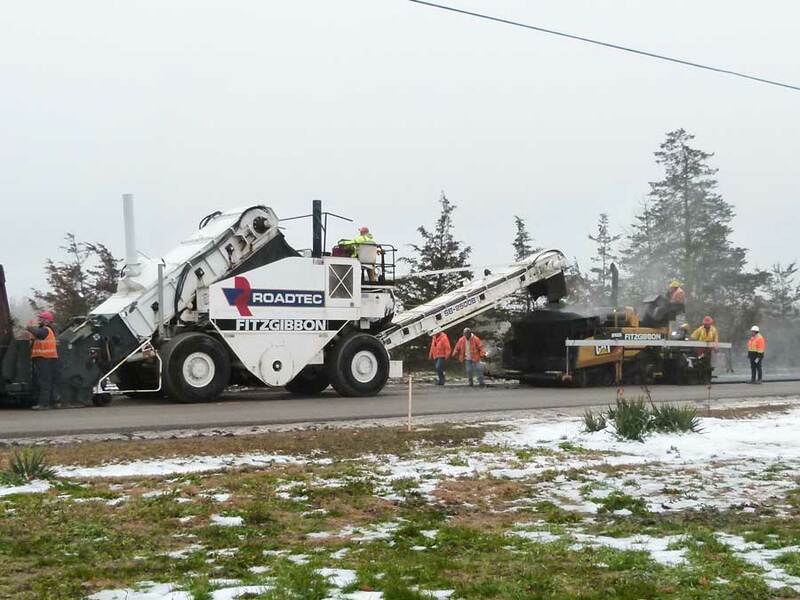 The long necked white RoadTec machine lumbered out onto the road and along to the end of the stretch to be paved, followed by the rollers and a yellow beast, again of mysterious function. I waited for them to reach my territory. They came in order. First a flock of dump trucks lined up for the privilege of dumping their loads of hot asphalt, one after the other, into the front maw of the RoadTec which, I was told, can store tons and tons of the stuff in its innards. The RoadTec chugged out the asphalt in a regular stream from its long chute at the back. The asphalt then entered the gaping mouth of the yellow machine which did the actual paving. For out the back it laid a flat layer of pavement one lane wide. And behind the paving machine came the rollers, rolling the asphalt compact and smooth while it still steamed with heat. For once cooled, the asphalt becomes hard and rigid, permanently keeping every lump, bump and dip not tended to by the rollers in time. So that was the day’s excitement. The parade of paving equipment, as coordinated as a ballet troupe, inching its way down one side of the road in the morning and back up the other side in the afternoon. There is now beautiful black velvet smooth road in front of the house with not a mark on it as yet. The dinosaurs are parked, the crew vanished away in the creeping dusk. The flying mud is sealed over. Passing cars can’t believe their luck and I now know how a road gets paved. There are many finishing touches yet to come. What will they be? Stayed tuned. Next Next post: Road Paving Finished at Last. For Now.